1971 was another successful year for Maico and Jonsson. It did, however, also hold one of motorcycle racing’s bitterest stories of poor luck and defeat, for both him and Maico. Jonsson, while leading the 500cc championship series in Europe, was poised throughout the end of the series for his third and possibly best chance yet of winning the individual championship. Going into the final race, he led Roger DeCoster (Figure 96) in the series by one point, overall. While out in front in the first moto at the St. Anthonis, Holland, world championship race on August 22, Jonsson’s 400 Maico lost power and came to a stop. The motorcycle’s spark plug had come unscrewed from the experimental light-weight cylinder head, recently installed by his mechanic. Of a very thin alloy, it had, in the process of expansion and contraction (due to heating and cooling, and as yet unbeknownst to Maico engineers), allowed the new short-reach ½ inch spark plug to vibrate loose and come out. This situation occurred on two other occasions in the preceding weeks to other Maico team riders, but had both times been attributed to simply insufficient tightening of the spark plug. Maico’s ignorance of the true nature of the problem would be painful. While Jonsson easily won the second moto, his overall score suffered and DeCoster jumped ahead to gain the 500c world championship yet again for Suzuki. It was an example of the ever present role of chance on racing, and a heartbreaking day for Jonsson, clearly the better rider that day, but destined to not be world champion. Jonsson was, by his own estimation in 1972, at the absolute pinnacle of his skill. 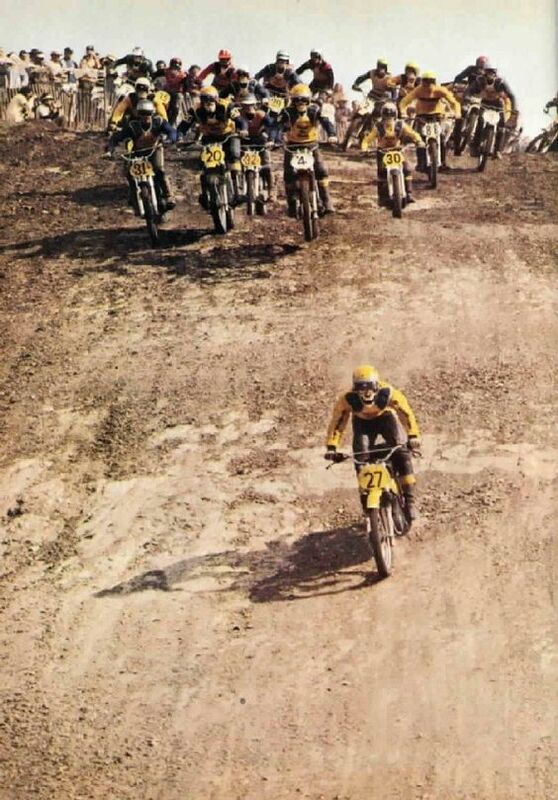 Even DeCoster, perhaps the most famous single name in motocross over the decades and currently mounted on the amazing RN73 factory Suzuki, was unable to ride with him. Jonsson felt released from mundane human limitations, transcending even his superior abilities: “In the second moto [at St. Anthonis], I remember thinking, while going down the straights . . . that I had so much time. So much time to the next corner; everything was possible. I was going very fast; sometimes when you’re not in good shape, you can’t think about anything on the straight. But this time it was so . . . easy. Everything was going so well; there was no problem. 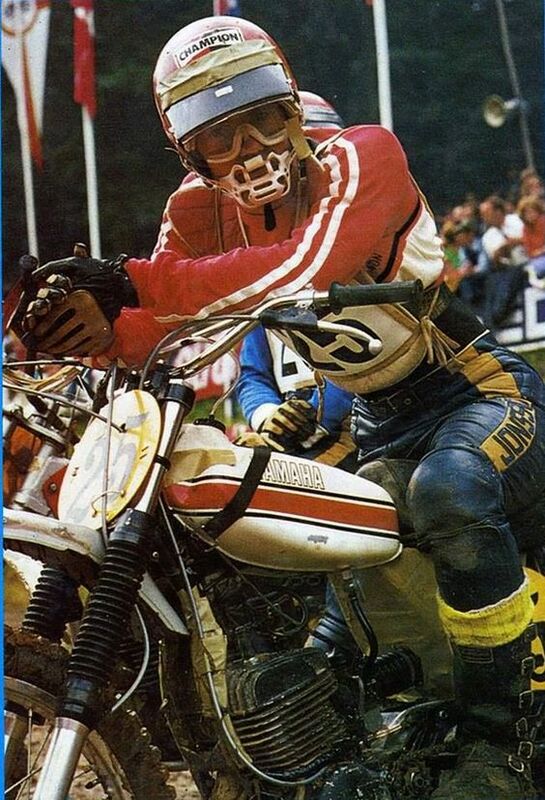 I remember the race after that—the Motocross des Nations race in Vannes, France—I won both motos there, easily, too.” Although Jonsson and his teammates did take the des Nations title for Sweden, his best career chance at the individual world championship had eluded him. Soon after the spark plug incident in Holland and with the real cause of the incident still elusive, a fourth occurrence happened while Jonsson was practicing. His team was certain this time that the plug had been correctly tightened, and the actual chain of events, relating to the new, thin head, was finally deduced. Additional metal was welded to the top of the new heads, allowing the use of the old, longer spark plug, and the problem did not recur. The crowning achievement of Jonsson’s time on Maico, the core of the “success years” for both, in his words, was certainly his phenomenal winning streak in the 1972 North American Trans-AMA series. Jonsson won nine of the eleven races outright, placed second in one race and third in another. His style, as Dennie Moore notes, was “Flawless. . . . like watching the Silver Surfer—something you’d animate and see made perfect. I remember him crashing in the first moto at Puyallup, Washington, and working his way up from last place to second place behind Mikkola (Figure 95) in that one forty-minute moto, then coming in first in the other for the overall win. I think Ake was probably the best motocross rider, ever.” Racer and Maico shop owner Gig Hamilton likewise recalls Jonsson’s control and grace: “When Ake rode, he was just part of the motorcycle; he never man-handled anything.” Jonsson’s riding style was a lesson in near-perfection: arms and legs notably straight back and weight aft on the jumps; fluid and seemingly-effortless over bumps and in the turns; always aggressive but ever under control. Jonsson’s grace on a racetrack had much to do with his practice of cardio-vascular and muscular conditioning, learned from training for speed-skating. While motocross has occasionally been referred to as the “world’s toughest sport,” it was also a very new sport, and sports trainers and physiologists had yet to consider it and develop training programs. The Swedes were early proponents of a solid training program; Husqvarna’s race team trainer in the 1970s and 1980s, motocrosser Rolf Tibblin, conducted organized physical training programs for team members during the winter months at the Husqvarna headquarters. In Germany, Maico rider Adolf Weil developed and shared his own regimen for strength-training and conditioning with Maico riders. The Europeans’ propensity towards physical training for motocross racing’s more intense demands was one factor in their early dominance over riders in the United States—who appear in photographs and film footage of the time often spitting out a cigarette as the starting gate drops. Over the years, this realization that athleticism must lie at the heart of the sport widened the gulf between motorcycle sport riders and the by then entrenched American biker-rebel-outlaw formula. In motocross, at least, no longer could a rider in the United States ignore physical conditioning, show up at race and execute a few fast laps around a scrambles track, dependent upon skill alone, and succeed. Motocross, with its two forty-five minute motos, was a far different event, and Jonsson and his fellow Europeans showed the way forward. 1972 was the end of Jonsson’s time with Maico. Yamaha offered him a contract with far more pay and the advantages of Yamaha’s vast engineering and financial resources, and Jonsson signed with them for the 1973 season. In hindsight, he believes the world championship would have been attainable in 1973 if he had stayed with Maico, but the Yamaha contract was too attractive to turn down. Jonsson was married with two children, and felt that he had perhaps three years left being competitive on the world class level. The actual earnings for motorcycle racers at the time, even the star European riders, were anything but phenomenal. 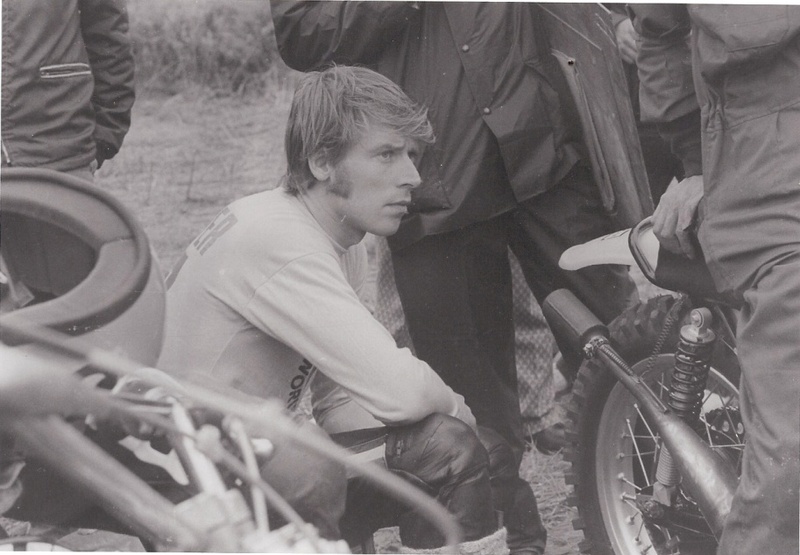 Jonsson stated in 1971 that he estimated that his pay the following year (1972, when he was generally considered to be at least one of the finest riders in the world) would about equal that of an average professional engineer in Europe. Considering the physical demands, the risk, and the short career of a professional racer, versus the expected working conditions of an engineering professional, the comparison is startling. (Salaries have changed over time. Within two decades, teenage motocross stars were earning hundreds of thousands of dollars a year.) Thus, whatever his reasons were, Jonsson left Maico, where he had for three years been on the cusp of not only being successful, but being world champion. He threw in his lot with Yamaha. Jonsson rode for Yamaha from 1973 through 1975. 1973 in particular proved to be a difficult year, with Jonsson riding a 360cc machine which, like his old 360 Maico, he felt was not powerful enough. Apparently not satisfied with the Yamaha suspension as well, Jonsson’s machine featured Maico forks, something quickly noted by the press and surely an uncomfortable situation for Yamaha management. A more powerful, long-stroke engine was provided in 1974, but half-way through that season he was arbitrarily told by Yamaha management to revert to the old 360 engine again. Not yet ready to leave racing, Jonsson rode a Kramer in 1978. The Kramer was made by a Maico dealer in Germany, using Austrian Rotax engines and monoshock frames of his own design and manufacture. The Kramer’s frame, however, was inferior to other world-class machinery, and the Rotax engine proved to be less than adequate. Jonsson left Kramer after the 1978 season. With the traveling continuing to bear down upon him and his family, he elected to race yet one final year for his local Swedish brand, Husqvarna. In 1979 Jonsson left racing for good and opened his own motorcycle shop, selling Husqvarna and Yamaha. He prospered for the next three decades, selling the shop and retiring in 2007. An adjunct to Jonsson’s racing experiences on both Maico and Yamaha is his presence on the two teams at precisely the time period when long-travel rear suspension (LTR) was introduced. After considering the juncture of Jonsson, Maico, and Yamaha in the previous paragraphs, I will now briefly discuss the intersection of these three entities with LTR. LTR is possibly the single most important innovation in all of motorcycling since 1970, and certainly so for off-road motorcycles. Maico and Yamaha, coincidently, are the two companies which were to introduce this concept in 1973. Very soon after Jonsson left Maico to ride the new Yamaha monoshock LTR machines in 1973, Maico introduced its own twin-shock LTR machines. Having been with the two teams which pioneered LTR at the time of its emergence, he is in a unique position to recall the innovation’s history. The inevitable “Who thought of LTR, first?” question is a difficult and complex one to answer. To begin, let us consider the question in a 1973 microcosm of simply Maico and Yamaha. While Jonsson concedes that Maico engineer Reinhold Weiher was the first to arrive at an obviously effective LTR arrangement with his modified twin-shock LTR Maicos, he cautions that “they (Maico) were also watching Yamaha.” As noted previously, Yamaha did enter LTR monoshock machines in European Grand Prix competition several weeks prior to Maico. Yamaha had actually first revealed its monoshocks as early as the previous year in Japan, in 1972, but whether word ever reached the other manufacturers is doubtful. To what degree Reinhold Weiher and Maico stumbled upon LTR independently or under the influence of Yamaha remains unclear. Weiher’s motivations were either to simply solve the rear wheel problem (as Selvaraj Narayana recalls in chapter 6.1); to increase rear wheel travel, after Yamaha’s lead; or, some combination of the two. Where the magic began: by moving the upper and lower shock mounts four inches forward, the Maico gained two additional inches of rear wheel travel and rode “like a Cadillac.” Jonnson however, departing for Yamaha in 1973 did not benefit from this improvement at Maico. 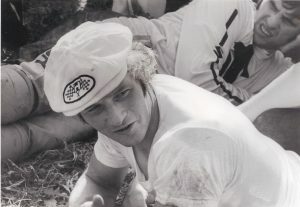 Jonsson remained friends with other Swedish riders, but admits to having lost contact with most of those outside his home country. A personal tragedy for Jonsson occurred when old Maico teammate Willi Bauer, with whom he had often stayed while visiting the Maico factory, was severely injured. Bauer had signed with the German Sachs company, and was practicing on a prototype motorcycle in Scotland in 1978. While running at only moderate speed, Bauer hit an unseen hole and was catapulted over the bars. He was paralyzed for life. 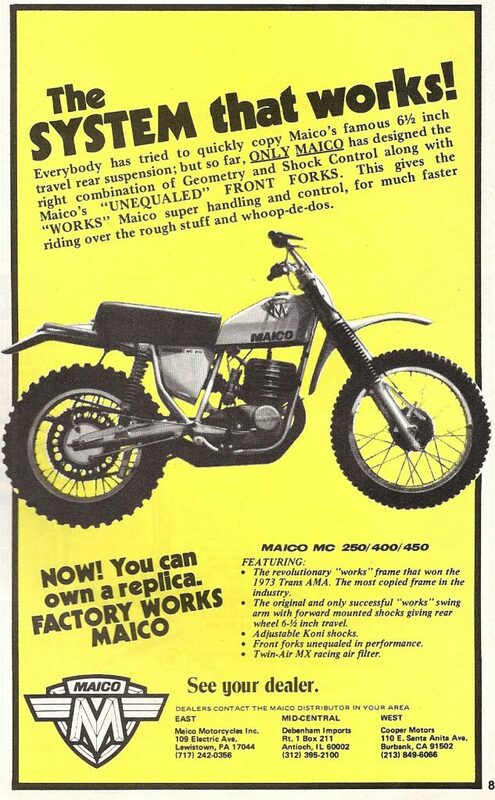 Production Maico of 1974 extolling long travel suspension. Jonsson’s Maico teammate and mentor Adolf Weil (Figure 97) passed away on May 12, 2011. He had long ago left racing behind him, and, after retiring from the motorcycle shop he ran with his two sons, preferred a quiet life in Germany. Unlike Jonsson, Weil remained with Maico for his entire racing career. If Jonsson’s is the face most associated with Maico, Weil’s is the second most familiar Maico representative. 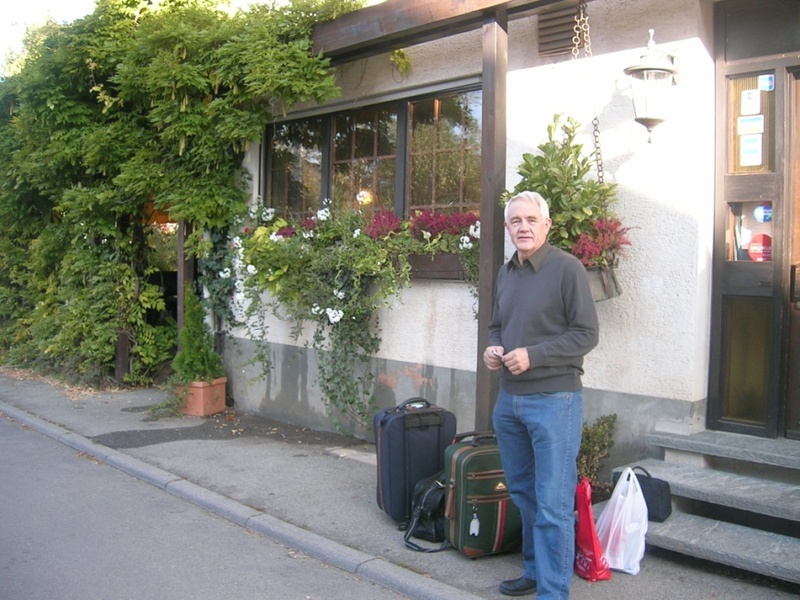 Jonsson visited the site of the old Maico factory in Pfaffingen in the autumn of 2007. He had not seen it for thirty years. Part of the original complex still stood, including a machine room and the main assembly room. Fading Maico stickers were still affixed to the windows, as men in long robes and turbans strode about the grounds. Ake Jonsson is now retired from the motorcycle business. When still running the business, he had on display in his shop two of his Maico racing bikes: the #27 (American series) and #2 (European circuit) machines. The #27 bike was a surprise gift to him by his son, Tomas, on the occasion of Jonsson’s fiftieth birthday. 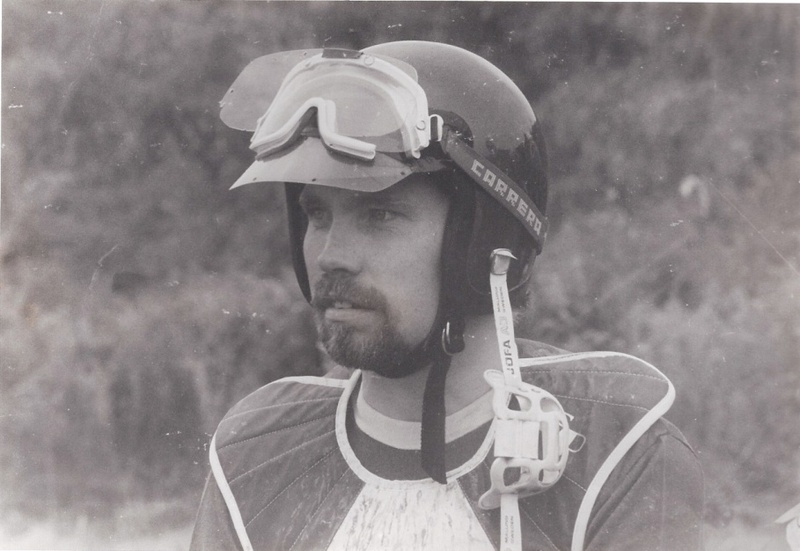 Tomas had obtained the motorcycle from ex-patriot Swede and long-time American citizen Lars Larson, who had purchased the bike in 1972 after the final race of the Trans-AMA series at Saddleback Park. Jonsson also retained his 1975 Yamaha factory OW26 motorcycle. Ake Jonsson is strongly remembered by riders in the United States who were part of 1970s off-road motorcycle sport. Several have even constructed replicas of his factory Maicos. These are the same men who were there at the birth of modern motocross in the United States, who read the magazines and were entranced by the smooth Swede on the exotic Maico. They perhaps were even able to watch him in person, smoothly pulling away from all challengers. Jonsson figures prominantly in some motorcyclists’ reconstructions of their own careers. Jonsson was the image many of them aspired to: a factory rider, successful, famous, and paid to do what he loved. A significant aspect of Jonsson’s allure is his history of beating the finest riders in the world on a motorcycle that anyone could buy. Jonsson’s Maico was known to be a basically stock motorcycle; if he could win with one, perhaps they, on a Maico, could as well. As they grow older, this memory of talent fairly trumping advantage intensifies: “Ake, Ake, Ake!” He was the best rider, mounted on the motorcycle that anyone could have. Ake proved that with hard work, desire, and an equal playing field, that any of them might triumph, as well. Jonsson broke the myth that winning at elite levels required something else that they, being common, were denied. He proved that motocross could be (if it not always was) a democracy and a meritocracy, not a sport where expenditure necessarily determined outcome. A million-dollar motorcycle was not required; Ake had shown them that. Among the young riders in the United States who held Jonsson in high regard were three young men from California, Ohio, and Pennsylvania. Tim Hart, like Jonsson, raced for Maico and Yamaha; Denny Swartz was an Ohio farm boy who won the last national race in the United States ever to be won on a Maico; and Brian Thompson is the suburban Pennsylvanian who helped to break the “color barrier” in American racing. They, like Jonsson, believed “everything was possible,” and next I will examine the lives and motivations of these young men. Interviews with Dennie Moore by David Russell. Interviews with Gig Hamilton by David Russell, June 19, 2007 and April 7, 2008, Harrisburg, Pennsylvania (Russell Motorcycle Sport Collection, Center for Pennsylvania Culture Studies, Penn State Harrisburg). Eric Raits, “Ake Jonsson Profile,” Cycle Guide (March, 1971), accessed November 24, 2014 on www.akejonsson.com/interviews-html. Paul Boudreau, “The Scene:Hang Ten United States Grand Prix,” Motocross Action Magazine, (October, 1973), 30-31. The photograph shows Maico forks on Jonsson’s Yamaha. Ecclesiastes 9:11 (Revised Standard Version). Reinhold Weiher and his innovation will be discussed further in chapter 6.1. Interview with Selvaraj Narayana by David Russell, June 27, 2008, Harrisburg, Pennsylvania (Russell Motorcycle Sport Collection, Center for Pennsylvania Culture Studies, Penn State Harrisburg). Interview with Gunnar Lindstrom by David Russell, January 27, 2008, Harrisburg, Pennsylvania (Russell Motorcycle Sport Collection, Center for Pennsylvania Culture Studies, Penn State Harrisburg). Gunnar Lindstrom, Husqvarna Success (Stillwater, MN: Parker House, 2010), 25-8, 131. 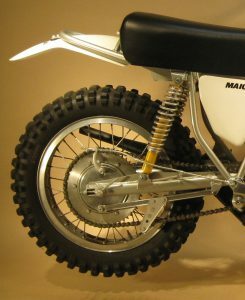 Although all these earlier designs would not be considered “long-travel,” in that they did not provide any more than the normal [pre-LTR] four inches of rear suspension travel, they do approximate the designs that later 1970s engineers would use to achieve greater and faster suspension travel. The AJS and Husqvarna Silvepilen designs did meet one aspect of LTR, though, in that they provided increased rate of rear wheel travel, by virtue of their mounting farther forward on the moment arm, assuming a similar damping rate as later shocks. The multi-faceted Lars Larson was an assistant to Edison Dye in the latter’s importation of Husqvarna motorcycles and the promotion of lightweight sport motorcycles in America. Larson was also a nationally-ranked motocross competitor and a gold-medal winning member of the American International Six-Day Trials (ISDT) team. Interview with Selvaraj Narayana by David Russell. “Ake! Ake! Ake!” was the headline of a British Maico advertisement, circa 1972. This entry was posted in Ake Jonnson, Maico, Motorcycle Culture and tagged Ake Jonnson, ake jonsson motocross, Motorcycle Culture, motorcycle history, motorcycle sports riders. specially the sabotage inside the teams. I was factory rider at that time with Maico and my mechanic worked on that solution. If you want to know the real story, contact me.